The Bertrand lab continues to churn out carbenes by the dozens. In a latest variation a NHC carbene has its reactivity pattern tuned not only to behave as a nucleophile (the default behavior) but as an electrophile as well (DOI). In a previous episode here one of the amino groups was replaced by a methylene group which enhances electrophilicity but also nucleophilicity. 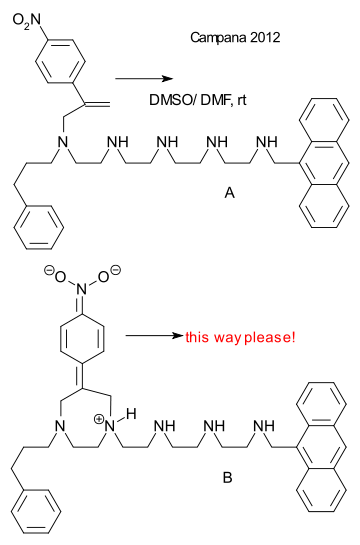 The new carbene has one of the amino groups pyramidalized which also increases electrophilicity (restricted N lone pair donation to carbene) but leaves nucleophilicity the way it was (no change in electronic contributions of the substituents). Deprotonation of intermediate 2 turned out to be tricky: at -30°C carbene 3 attacks the base KHMDS by N-H insertion. Hence the -70°C. 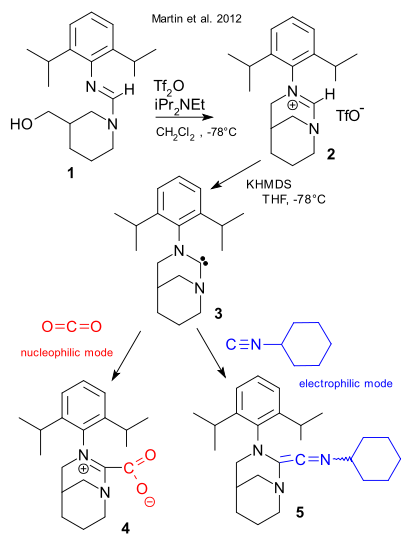 Nucleophilicity was then demonstrated by reaction with carbon dioxide and electrophilicity by reaction with cyclohexylisocyanide (otherwise an unknown reaction mode for NHC carbenes). In a new episode of Making It Move we take a look at the Michael addition Molecular Walker as conceived by Araceli Campaña et al in Angewandte (DOI). Bioinspired by the motor proteins kinesin and dynein, this surprisingly simple two-legged creature is a-methylene-4-nitrostyrene and its platform a string of polyethyleneimine. Walking is possible by virtue of a series of reversible intramolecular Michael and retro-Michael additions. The motion is not unidirectional: a bunch of walkers will continuously move around, each on its own track and when after some time chemical equilibrium sets in there is no longer any apparent change as monitored by proton NMR. In DMSO the half-life for a single step is 1.5 hours. When walker-free amine is added, after 3 days only a fraction of walkers have detached from their own track as monitored by mass spectroscopy. When the central amine groups are replaced by methylene groups no walking takes place at all meaning that the walkers are unable to cheat by moving from start to finish in one go. 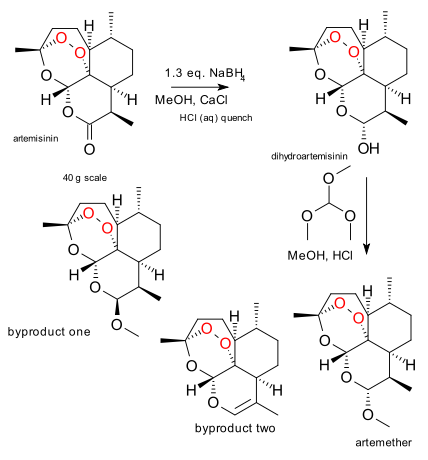 In one configuration, an anthracene unit was added to the opposite end of the walker, known to quench nitrostyrene fluorescence. Lo and behold, the fluorescence in DMSO decreased by 50% over a period of 5 hours. Check out this BASF promo on youtube. The video warns that pretty soon in 2050 we share the world with 9 billion people who want a "livable environment", a "stable climate", "clean water" and most of all a "sustainable future". BASF creates chemistry! All nice and well. But what are the labcoat-wearing individuals admiring right in the middle of the clip? n-octane? What kind of message is that? In 2050 we will still rely on gasoline? Octane's only claim to fame is its presence in gasoline. And BASF does not have to create it, just distill it. Okay it could be perfluorooctane but here Wikipedia does not list any cool sustainable applications either. What more appropriate molecules could BASF have showcased? They make a lot of pesticides like Fipronil. In the promo the company mentions it is dedicated to increasing crop yields and pesticides are one way to accomplish that. BASF also makes a lot of polyurethanes that help reduce the weight of any transporter. It also sells isometheptene. With 9 billion fellow humans you may need that occasionally. Another one of those unsolved problems in chemistry solved! At least according to Pérez et al. who have news to report regarding water clusters (DOI). Simple water is not just a collection of water molecules: due to hydrogen bonding water molecules tend to cluster into larger assemblies but what do these assemblies exactly look like? The proposals vary from dimers to (H2O)100 networks but tetramers, pentamers and hexamers take prominent positions. Pérez has been looking at hexamers only and more specifically the hexamer isomers. The weapon of choice: rotational spectroscopy or more precisely a chirped-pulsed Fourier transform microwave (CP-FTMW) spectrometer. Rotational spectroscopy can only be applied to gas phase molecules which makes you wonder how it can be used in a typical bulk property. Experimental details are scarce but probably the method works by ejecting liquid water into a vacuum and then the clusters are analysed as they break up? A carrier gas is also involved. Somehow. The working temperature is not mentioned anywhere. Out comes a complex spectrum but based on computational modelling all peaks can be assigned to the heptamer and three hexamer isomers: a cage, a prism and a book with population ratio 1:1:0.25. Rest assured, there are complications: the ratio depends on the type of carrier gas and peaks multiply by using oxygen-18 enriched water. The presence of a book geometry is counter-intuitive and instantly this blogs favorite. With 5 idle hydrogen atoms, this isomer should convert to the prism (three idle hydrogen atoms) with ease but does not. And what about a (H2O)6n ladderane?